The Menetries's tiger moth (Borearctia menetriesii) is the most rare and enigmatic representative among the Palearctic Arctiinae. During an expedition in almost inaccessible wild taiga area of Eastern Siberia, Russian scientists had the luck to encounter it. During their studies they also recorded feeding larva of this mysterious species on a native devil's helmet host plant for the first time. 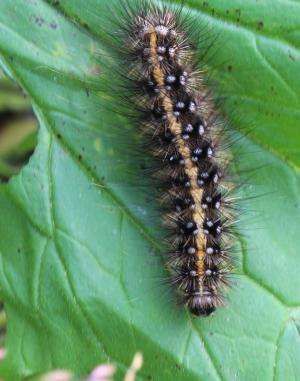 The study was published in the open access journal Nota Lepidopterologica. The Menetries's tiger moth (Borearctia menetriesii) is the most rare and enigmatic representative among the Palearctic Arctiinae. Only single specimens were found in the majority of known localities, and sometimes the records are separated from each other by many decades. For example, there are four records in Finland dating between 1913 and 1943. The moth has not been observed there since 1943 and seemed to be locally extinct, until it was rediscovered in 2003. Among the entomologists and amateurs, only lucky ones have a chance to meet this wonderful species in its natural environment, but usually this chance comes only once in a lifetime. There are only four people in the World that were happy to twice catch the Menetries's moth, namely Alexey Kurentzov (in 1951 and 1955), Yury Korshunov (in 1964 and 1966) and Andrey Sviridov & Vladimir Murzin (in 1977 and 1979), all of them are the famous Russian lepidopterologists. The biology of this large and colorful moth is poorly known because of its extremely low abundance throughout its distribution range. During the expedition in almost inaccessible wild taiga area of Eastern Siberia, Russian scientists have recorded feeding larva of this mysterious species on a native host plant for the first time. 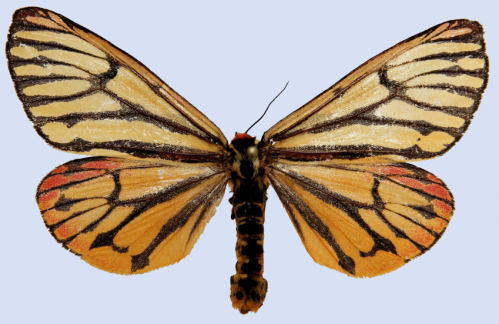 The study was published in the open access journal Nota Lepidopterologica. The host plant was the red aconite (Aconitum rubicundum). The various aconite taxa (Aconitum spp. 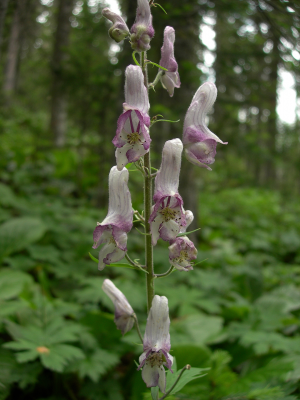 ), also known as devil's helmet, wolfsbane, etc., are strongly poisonous for insects because of the high alkaloid content. There are only 18 Lepidoptera species listed as aconite feeders. The red aconite is a close relative or even subspecies of the northern aconite (Aconitum lycoctonum), which is widespread across Eurasia, but has scattered distribution in Fennoscandia. The majority of moth localities are situated within the distribution range of the northern aconite and other related taxa, which are diverse and widespread in the Eastern Palearctic. However, only two of the six westernmost Borearctia menetriesii localities in Finland are in accordance with sporadic records of the northern aconite. Our record confirms that the Menetries's tiger moth is a polyphagous species like most other boreal Arctiinae. In contrast, aconite species might play an important role for this species as suitable source of alkaloids, which could be necessary for the protection of overwintering larvae against fungal and bacterial diseases.